It is hard to miss Dorf Tirol when you are in Meran. Its edges loom over you when you are walking through Meran’s old town, or whenever you glance in its direction. 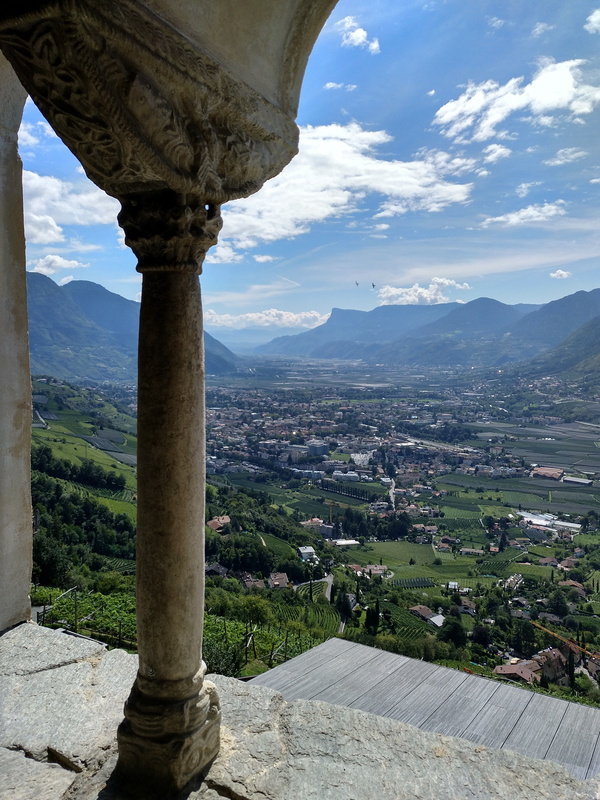 Although I am not sure where Meran ends and Dorf Tirol begins – and borders are such fickle things anyway – it seems like you leave the bustling city behind as you begin your sharp ascent up to Dorf Tirol. Once you leave the city, you are climbing steeply through vineyards and orchards – massive apples and heavy vines, laden with grapes awaiting harvesting. While catching your breath, take a look behind you at the view. If there is a direct way up to Schloss Tirol, we didn’t find it. This meant that we wandered a bit further than we intended, over a waterfall, and to another castle: Schloss Thurnstein. Probably one of the most picturisque castles in the area. Schloss Thurnstein, 2018. There is a nice restaurant with a terrase at the castle, so you can have a beer or a coffee, maybe even lunch, while overlooking Merano. I unfortunately did not take a look at the menu, so I can’t say if they have anything gluten-free or not. It is a nice place for a coffee though. 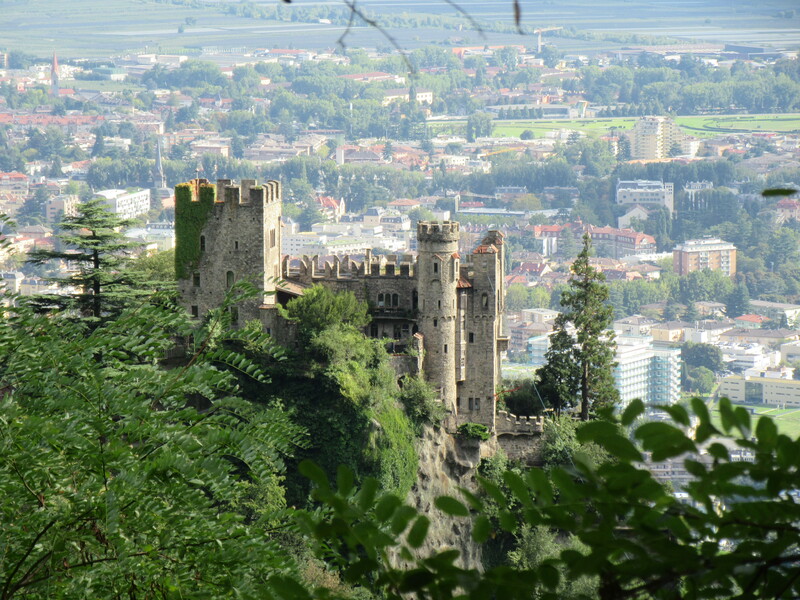 From Schloss Thurnstein, it is an easy, 30 minute walk over to Schloss Tirol. And while you can’t stay at Schloss Tirol, there is a hotel in between the two castles with an amazing view, the Residence St. Peter. 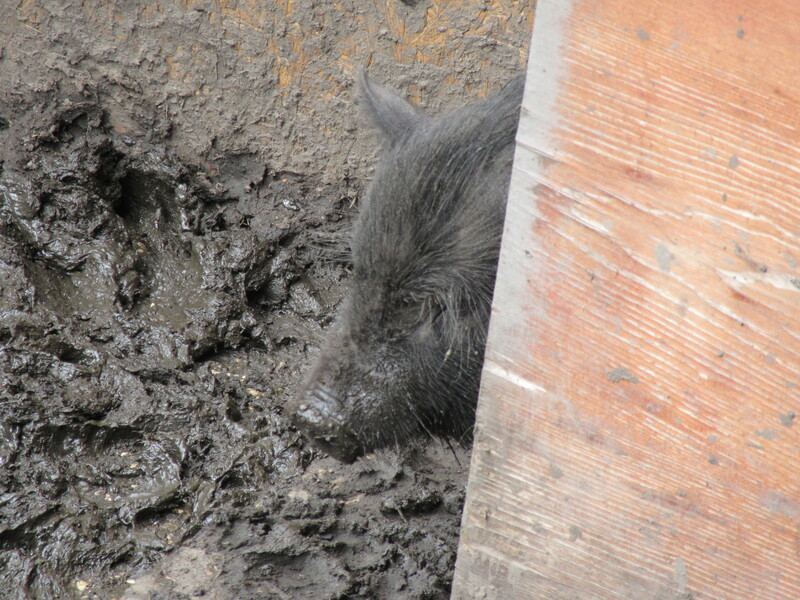 Keep walking to Schloss Tirol and you’ll pass a waterfall and more orchards, before finding yourself behind the castle where the animals are kept. From here, you can either go to the falconry show for 10€, go into the castle for 7€ (unless you have the mobility and museum card, then it’s free! 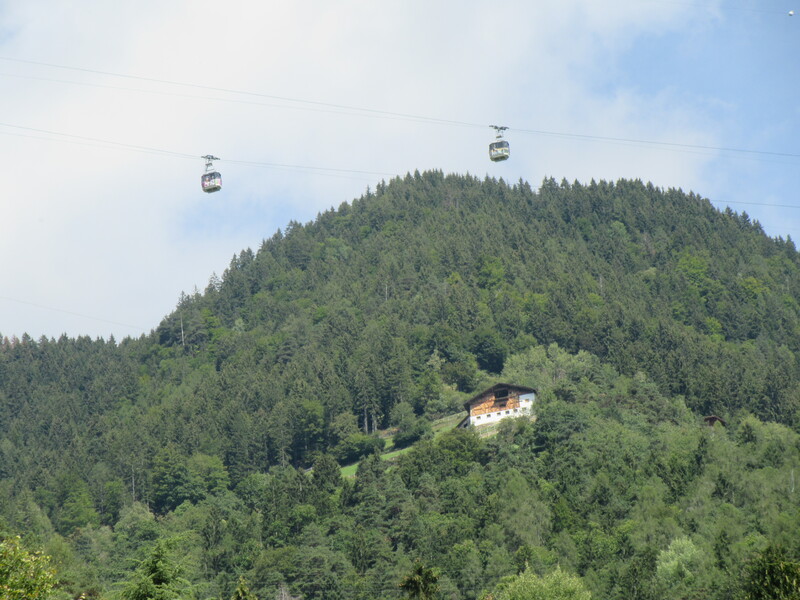 ), or walk down to the Dorf Tirol. We did all three. 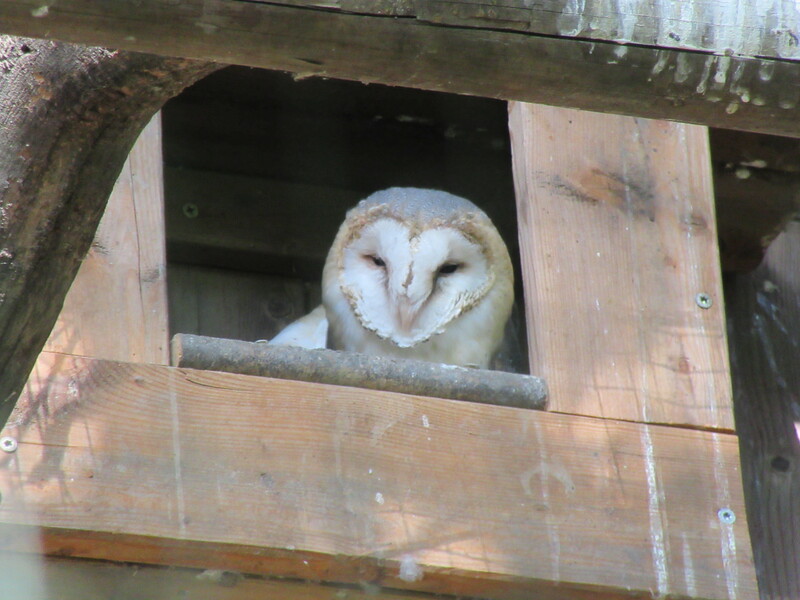 The falconry show is a bit expensive but you get an amazing view, while watching owls and eagles swoop over your head. The Schloss itself is also worth a visit for history buffs, as the museum walks you through several hundred years of history. Most of the museum is in German or Italian, with some exhibits in English as well. The falconry show is an interesting mixture of Italian and German. Continue along the path to Dorf Tirol, where you can either take a bus back to Meran, walk down, or have supper at one of the many different restaurants or hotels. Unfortunately only the Hotel Mair am Turm is certified by the AiC and we weren’t able to get a table when we went, so we went down the street to the Restaurant Sonne. The serving staff seemed a bit confused about what had gluten and what not, but the chef himself did know about preparing gluten-free food and had some Barilla pasta available. 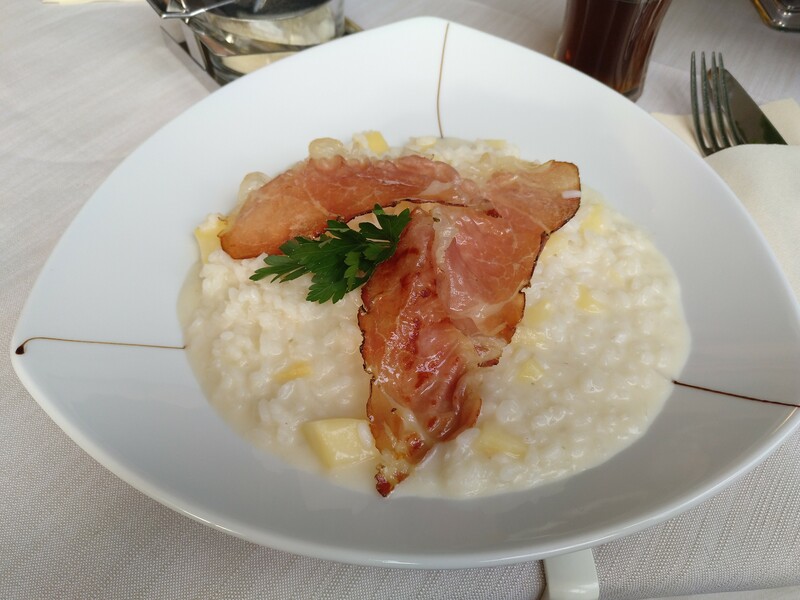 I went for the apple risotto, that had massive slices of Tiroler Speck on it, and the salmon tartar as a starter. 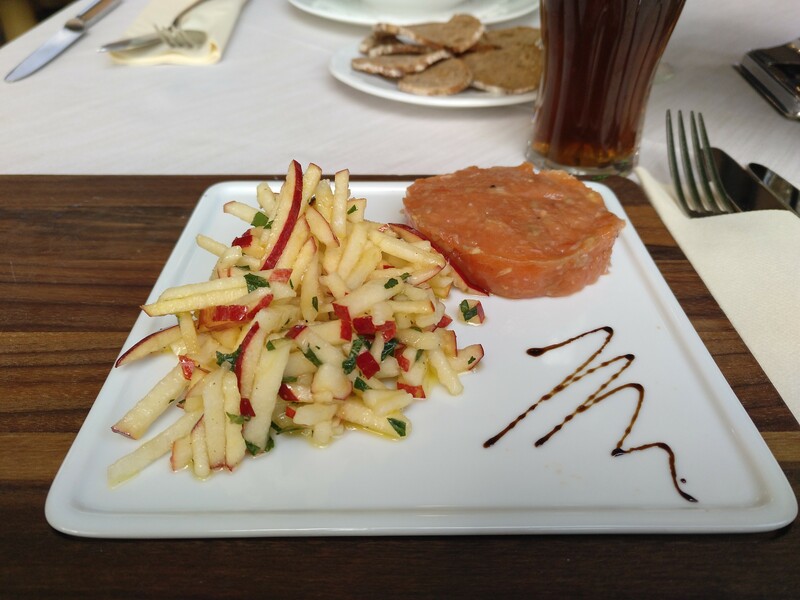 Just double-check with the staff and mention that the bread shouldn’t be on the same plate as the salmon. It was delicious, and the views fantastic.